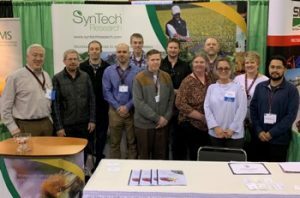 Last month, SynTech Research staff from across the US participated in the 2019 National Alliance of Independent Crop Consultants (NAICC) Meeting in Savannah, Georgia. The Alliance consists of agricultural professionals who provide research and advisory services; it supports independent consultants and researchers and provides a forum for information exchange within the agricultural community. As well as meeting current and potential new clients and cooperators and expanding knowledge by interacting with other crop protection experts and vendors, colleagues attended the associated SynTech one-day NAM Workshop. This covered strategy, organization, training and business development of SynTech’s efficacy, environmental fate, ecotoxicology and program management services to agrochemicals and seeds customers.